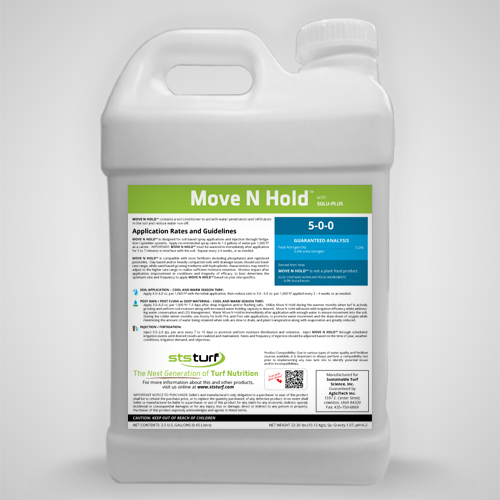 Move N Hold™ is a soil conditioner, based on fully biodegradable components, non-ionic surfactant and polymers, complexed with organic and amino acids. Aids in water penetration, reduced run-off, and uniform soil moisture. Retains moisture in sandy soils to reduce water use, and help manage Localized Dry Spot (LDS). Organic & Amino Acids in Move N Hold™ can enhance nutrient availability and stimulate microbial activity. Contains no salts – Very stable at a low pH. Active Ingredients: natural polymers, and derivatives. Move N Hold™ is not a plant food product.